The tales of Henrietta, an extraordinary old bear! mmmm … I don’t need a wash as I smell sweet, a bear should never wash everyday! Or my fur will fall fall out! “Let’s investigate Pip! The humans have lots of interesting stalls, I need new shoes and a dress, and you need a waistcoat Pip to keep you warm”. “Oh, yes please” said Pip. Henrietta looked at everything curiously whilst Pip stayed in his basket. “There’s a waistcoat that will fit me Henrietta and look, the other lady on the next stall has clothes and shoes which will fit you”. Pip tried the waistcoat and he looked very smart. Henrietta tried on a red dress and matching shoes and she looked very pretty. “Excuse me Madam, how much is your tiniest of waistcoats for my little squirrel friend Pip? He feels the cold terribly and this will keep him warm.” said Henrietta. “I’ve never met a bear who speaks and does their own shopping” said the lady. “I am not an ordinary bear”, said Henrietta, “I am an extraordinary bear, Pip has 2 acorns he could swap for your waistcoat”. “I think that will be perfect,” said the lady, “thank you very much”. “Thank you Henrietta”, said Pip, he loved his new waistcoat. Henrietta moved along to the next stall where she saw a lovely new dress and shoes. “But you don’t have any money, Henrietta,” said Pip. The lady looked at Henrietta and wondered what she could do to help Her buy the shoes and dress. Henrietta smiled sweetly. Henrietta modelled all of the children’s clothes for the lady, and the lady sold all of the clothing thanks to Henrietta’s help. No one had ever seen a bear modelling and smiling before and everyone gathered around in curiosity to look at Henrietta. The lady wrapped up Henrietta’s new clothing and Henrietta put it carefully into her basket with Pip sitting on top of it. The lady also gave Henrietta and Pip a bag of crisps and sweets to enjoy on their way back home. “What a wonderful afternoon Henrietta”, said Pip. 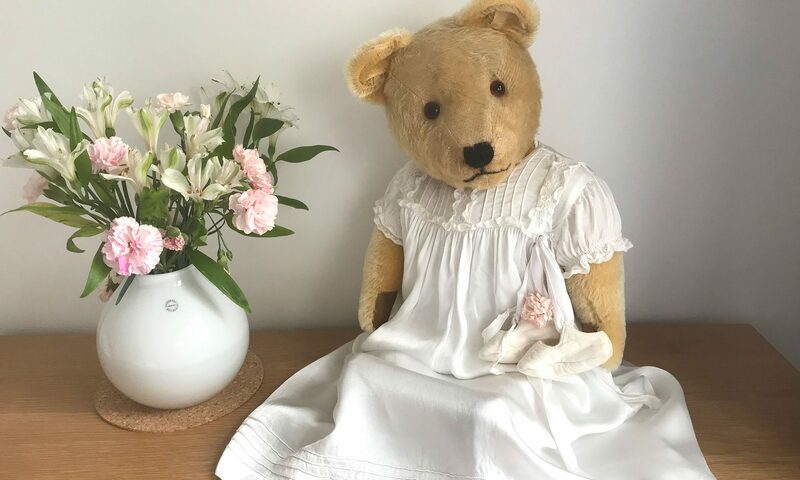 “Oh yes Henrietta, you are truly an extraordinary and very kind old bear” said Pip, smiling from ear to ear. Copyright Ann Harwood, My Old Teddy Bear. I know I am a bear, but I woke up this morning and knew that it was my 5th birthday and as my Mama had told me that when I reached 5 years of age it’s when I had to start wearing my school uniform and go to school like the children. I am so excited to start going to school and meet lots of children and learn new things like, reading, writing and how to use a computer but the most exciting thing is all of the fun I will have playing games. Mama doesn’t know how much I want to join in at playtimes. It’s the best part of going to school! I never told her I could read and write as bear’s know these things as soon as they are born so I know I will be a “SMART BEAR” he he he. A bear doesn’t have many teeth – I only have two, but children need lots of teeth so we all have to remember to brush our teeth before going to school and before we go to bed. The weather man on the television says we are going to have a heatwave this coming weekend! I should look for my sun tan lotion to protect my fur, but last time I used it a whole swarm of insects surrounded me and stuck to my fur and it took about a week before the stickiness all washed off! HMM, maybe I’ll just go and hide in the woods where the sun doesn’t shine!